I am completely biased in saying this as the Crumb Cafe’s co-head director, but the café has truly become one of my favorite spaces on campus. Sure, our wait times can be inconsistent, but what was once a financially floundering café operating in the refuse of Pub Nite’s parties has now turned into a thriving, intimate student space. It is a place that the student body can take ownership of, whether for a study session the night before an exam, a bit of respite from one of Swarthmore’s famed Saturday night raves, or a homey feeling away from the stress up the hill. As hundreds of hungry college students descend on the café every night, it is the night staff’s dedication, ideas, and work ethic that have turned the place into what it is today: a mainstay late-night food option that functions as a study space, social scene, and new environment for many people on campus. When we as directors first decided to change locations and revitalize the café, there seemed to be no way that our team could handle the massive increase in demand running the campus’s only late-night option. Each night at our former space, Paces, had consisted of six staff members that would manage only a few hundred dollars of revenue per week over the four days a week that we were open. Then, Essie’s closed on weekends and we had to deviate from our initial plan of simply moving spaces. We were forced to take on the brunt of Swarthmore’s late-night food demand and accept meal swipes. Our Crumb team still has to deal with extremely limited, spread out inventory space, our own shortcomings as directors, and unruly customers. And now, each night’s staff manages an industrial-grade kitchen that processes roughly a thousand dollars of revenue per night with only nine people. That is truly a testament to our new staff who have learned the ropes on the fly, and it is due time that the rest of campus appreciates them. So often, service workers get the short end of the stick in professional settings. Service workers must navigate customer service situations and cater to every type of person, on top of providing a quality product. When I used to work at Starbucks, a woman once demanded that I make her a “hot smoothie” at the threat of reporting me for insubordination, and when I complied, she promptly spit it out and poured it on the floor. It seems as though every food, retail, or other service worker I have met has their own anthology of similar horror stories. Our staff must innovate and adapt to missing inventory, broken machines, odd recipes, and other impediments. Still, I have seen my own staff and EVS workers at Sharples disrespected. In some of the most egregious incidents, customers have physically impeded the work of EVS workers and drunkenly berated staff for “missing” food that has been waiting for them on the bar the whole night. Many of the issues that customers face are completely out of the hands of night staff: missing inventory, inadequate equipment, et cetera. This phenomenon reflects a concerning sense of entitlement on campus. I will readily admit that there is plenty to complain about with the current food options on campus, but we are attempting to do something about it. It was a vision of a vibrant student space with fresh and interesting food options that motivated Ahmad Shaban ’19 and our then-Paces-leadership team to change locations and revitalize the café. We, as the café’s directors, have certainly not fully achieved this vision yet, but in the meantime, our night staff has been working hard in the kitchen to satisfy hundreds of hungry mouths. They are working with less training than most food service workers and are doing a phenomenal job on top of the other work and stress that comes with being a student at this institution. That is just something to keep in mind next time your avo-toast takes a few minutes longer than expected: our workers are students just like you and their work should be celebrated. And we have certainly had significant help along the way. Linda McDougall and the rest of her Sharples staff have been phenomenal hosts as we have navigated the early struggles of sharing their kitchen. Their staff, including familiar faces like Mutabar Mills, have given us suggestions on how to improve our recipes. Sharples’s leadership has helped us through the difficult protocols for inventory and food safety, and it has really made this transition process a team effort. We are constantly striving to shore up some of our closing procedures to make Sharples’s job easier, but our working relationship has been a huge factor in our success. 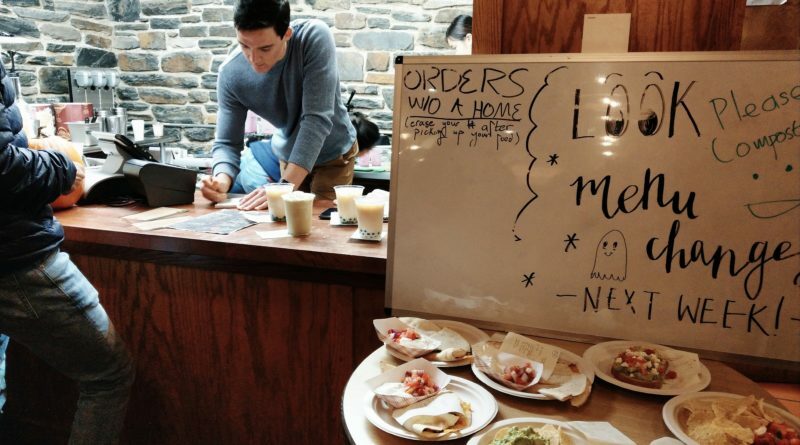 Furthermore, despite being an exclusively student-run café, we have received a lot of help from Swarthmore administrators, who have offered their guidance and extensive experience. Anthony Coschignano, Jeremy Koepf, Anthony Condo, Chip Proctor, and Ben Wilson make up a short list of the many stakeholders that help us regularly. EVS recently took over the responsibility of cleaning Sharples from an independent contractor. Throughout the transition the new space, they have also helped us tremendously through their diligent work and their ability to adapt to our needs. The proper cleaning of food service areas is a painstaking and labor-intensive process for the constant threat of bacteria and allergens and EVS has taken on that challenge head-on. On behalf of all Crumb Cafe directors and staff, thank you to all of these people and so many more who have contributed to our transition and financial viability. Yet there is so much more to come. We are acutely aware that the customer experience is not perfect and are working to create more consistency in our recipes and our wait times. We are working to adjust our protocols to meet the needs of Sharples, our customers, and Crumb staff alike: we aim to provide more training in applicable and transferrable culinary skills, and constantly change our menu to create interesting new menu items. We have helped spark a conversation on campus about reforming the current pay grades for student workers and are creating spaces for student groups to get major publicity for their causes. In this light, I would like to shout out my amazing director team for all of their largely-unseen, behind the scenes work in keeping the café running: Steven Fernandez ’20, my co-head director; Zach Lytle ’21 and Sue Kim ’21, kitchen directors; Kathy Nguyen ’21, public relations director; Andrew Choe ’20, finance director; and both Ahmad Shaban ’19 and Henry Han ’20 for their past work as directors. Now that we are more established with a transitional semester under our belts, it is far easier to implement the changes that we, as a student body, collectively want. We are excited to continue working to make this space better for everyone. Getting involved with the Crumb Cafe is a great way help make this campus better for the future; there are ways both big and small to contribute. Yes, working for the café is an option (please apply through JobX), but we also want to involve the student body in other ways. Our public relations director, Kathy Nguyen, is always looking for student art and collaborations with other campus organizations. We are also always open to new recipes and events in our student space. Again, this is a student-run café that we can all take ownership of and make into whatever space we please. 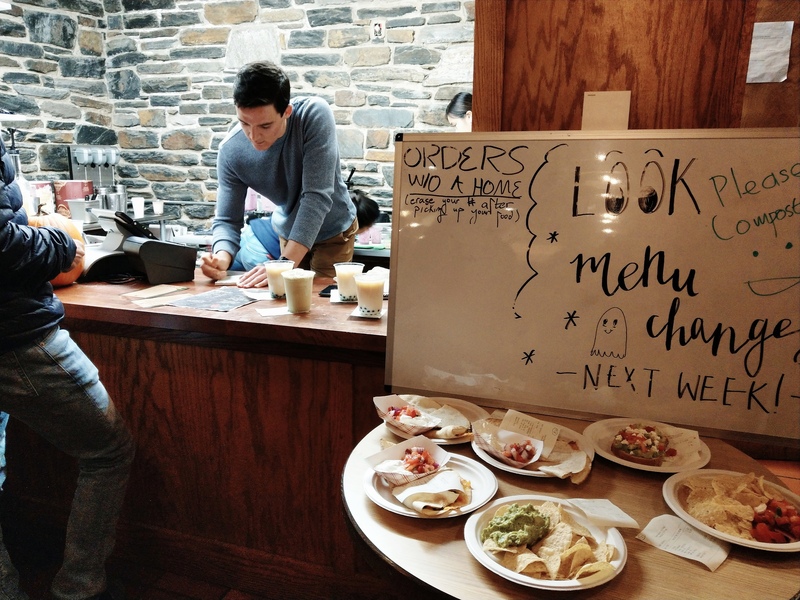 If you have feedback, ideas, or questions, email us at crumbcafe@swarthmore.edu, talk to a director in person, or look out for our coming feedback box in the café. Finally, thank you to all of you, our customers and friends, for making this transition process enjoyable and for understanding the trials and tribulations that we have faced along the way. Across our staff, the most common favorite aspect of working at Crumb is seeing the smile on someone’s face when they serve them a milkshake or quesadilla that makes their day. Without your support, this space would not be sustainable or successful. Let’s continue to work together to create a better space for all students.